After being mighty impressed with Newk's previous album, Glorious Warrior, which gathered something in the B range from me in terms of how good I thought it was, I concluded it was time for me to hunt down Heavy Life, the group's latest album, released in 2010. The record isn't much different than Newk's previous efforts, but it boasts an improved production, as well as slightly better songwriting. The chorus hooks are exactly what I've come to love and expect from the band, but I can't help but feel some of these tracks were left over from the previous writing sessions. It's true what they say: a band's material will always sound similar to what came before because it's the same group composing the music. However, in Newk's case, it's not specifically a rehash, but rather a different take on their patented formula. I'll say this much: It was an agonizing wait for Heavy Life to travel across the sea from South Korea to my doorstep in the United States. For months, I had been enjoying what appears to be the lead single from the album, "We Need," through its music video, but I was never able to find a place to purchase the album until I finally took the plunge on Amazon where a record store in the band's home country was offering worldwide shipping. Even though I paid somewhat of a hefty sum when compared with a normal CD, it was worth every cent I threw down on virtual counter for it. If you've heard Newk before, you'll love this record, and maybe even proclaim it as their best. The production is much less "buried" than Glorious Warrior and packs a punch this time around, too. Songwriting is very strong, which is typical of Newk, and the tracks grab you faster as well. Glorious Warrior took countless listens to really understand because it was so hard to differentiate each track from one another, but Heavy Life pelts listeners with loads of distinct melodies--some peculiar for the band, others familiar. 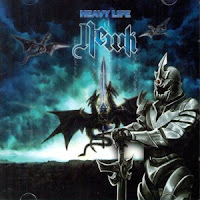 Nothing on Heavy Life hasn't been done before, but Newk executes traditional heavy metal very smoothly, creating a mix of memorable rockers and slower clean pieces. From synth laden tracks like "We Need" to the delicate string plucking of "널 보내고" to the double bassing strewn out in various songs, a smidgen of variety is scattered throughout the album as you make your way through the track list, but for the most part, once you've heard one cut, you've heard it all. This is common for Newk because they're stuck in their styled bubble, but at least they're honest and upfront about what's in the package. As long as you like heavy metal's stylistic origins, you'll love Heavy Life. The only song destined for the trash is "Thank You" because it reminds me of a sappy acoustic ballad an eighties band would have plopped down on their recording resume to make big bucks. In short, as I work to sum up this album in a concise little paragraph, Heavy Life is an improvement over Glorious Warrior, not only in songwriting, but in production and writing quality. It's instantly accessible and less samey than what I've come to expect from Newk, but it doesn't wander too far from its roots in fear that a drastic change in sound will occur. I open my arms to the band experimenting, but, ultimately, it's only up to them if they want to walk down that path. As I wait for their next record, I'll be spinning this one on a regular basis, and my anticipation remains high. Let's just hope they can top this one because, in all honesty, it's going to be quite tough.